Mix is a range of nesting visitor and conference armchairs with a modern feel and heightened comfort. Chairs feature either a medium or full upholstered back, fixed at the armrest to achieve enhanced responsiveness. 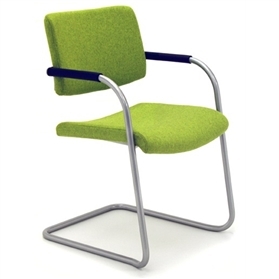 An equally comfortable contoured seat allows the user to sit in comfort during longer periods. A choice of silver or chrome cantilever frame also promoted micro-movements by the user, avoiding many of the problems associated with sitting still for a long time. A discreet buffer pod below the seat avoids marking of seat fabric when chairs are stacked.